A fuel cell creates electricity from a chemical reaction, not combustion. You get awesome performance, an incredible ride and a carpool sticker that tells the world you're aiming for zero (emissions, that is). According to the U.S. EPA burning fossil fuels in cars, trucks, ships, trains, and planes is a leading source of air pollutants and greenhouse gas emissions. Hydrogen production is a chemical reaction; using heat and catalysts to release hydrogen molecules from natural gas or biogas, or using solar or wind energy to electrolyze water. The fuel cell in an FCEV also uses a chemical reaction to convert hydrogen and oxygen into electricity. From well to wheels, FCEVs using hydrogen create almost zero air pollutants and greatly reduce GHG emissions. Who controls the energy system? Are we dependent on an outside source? Is the system robust? Will we run out of energy or the ability to transport the energy? How fast can the system respond—and recover—from a disruption?" California's Alternative Fuels Plan estimates that we can displace four billion gallons of gasoline by 2020 through a diversity of alternative fuels. Hydrogen is one of the few fuels that every region can produce locally from its own natural resources. You get the best of both worlds: performance, range and refill time similar to combustion vehicles, and the quiet operation, zero emissions and power of electric drive. FCEVs accelerate quickly and easily cruise at highway speeds. Their MPG equivalent is impressive—two-to-three times as many miles as their combustion counterparts. Today's FCEVs have a range of about 300 miles on a full tank. Inside, fuel cell electric vehicles are as spacious and comfortable as any other vehicle. They have room for four-to-five passengers and plenty of cargo space. The controls are all familiar, although the dashboard gauge displays kilowatts instead of RPMs. Many FCEV drivers and passengers remark how quietly their car or bus runs. 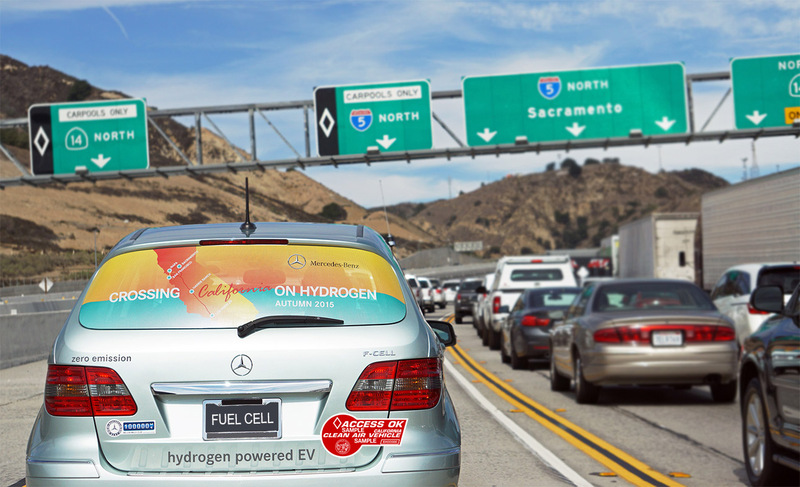 Travel solo in the carpool lane in a fuel cell electric vehicle. FCEVs owners can apply for a red Clean Air Vehicle Decal so you can enjoy life in the fast(er) lane. And filing for your $5,000 rebate is pretty fast, too. The Clean Vehicle Rebate Project (CVRP) promotes clean vehicle adoption by offering rebates of up to $5,000 for the purchase or lease of new, eligible zero-emission vehicles, including electric, plug-in hybrid electric and fuel cell vehicles. As long as funds are available, eligible California residents can follow a simple process to apply for a CVRP rebate after purchasing or leasing an eligible vehicle. Beginning January 1, 2018, buyers or lessees that have a gross annual income above $150,000 for a person who files a tax return as a single person, $204,000 for a person who files a tax return as a head of household, and $300,000 for a person who files a joint tax return are eligible for a consumer rebate from the Clean Vehicle Rebate Project or a Clean Air Vehicle decal for HOV lane access from the California DMV.